We are interested in things, the common denominator of which is the Osage River – for 35 + years exploring prairies, small towns, the Ozark-prairie border, doing some snake hunting in the middle part. Leland has fished the lower Osage since he was a child.That the river and its denizens had literary potential was not initially obvious. Leland’s father was an engineer for the state of Missouri, inspecting the water systems of small towns. Some days, young Leland would join him on his visits. He’d let the boy out to explore while he made his rounds. At Osceola one day, Leland got a Coke at the café by the low dam on the Osage and wandered down to the river. He found the carcass of a huge catfish, 5 feet long, floating belly up at the base of the dam. The next year he read Hemingway’s Old Man and the Sea when Life magazine ran it as a series. In the end scene tourists look at the carcass of the great marlin and misunderstand the explanation of a local who says ‘sharks’ – meaning that’s what killed the marlin. They take his words to mean that the carcass is a shark. Flashback to the big, dead catfish. The Osage River became a literary river then – associated with words and stories. It was more literary than the clearer, scenic, Ozark rivers, which are art rivers, visual places, with smaller literary components. 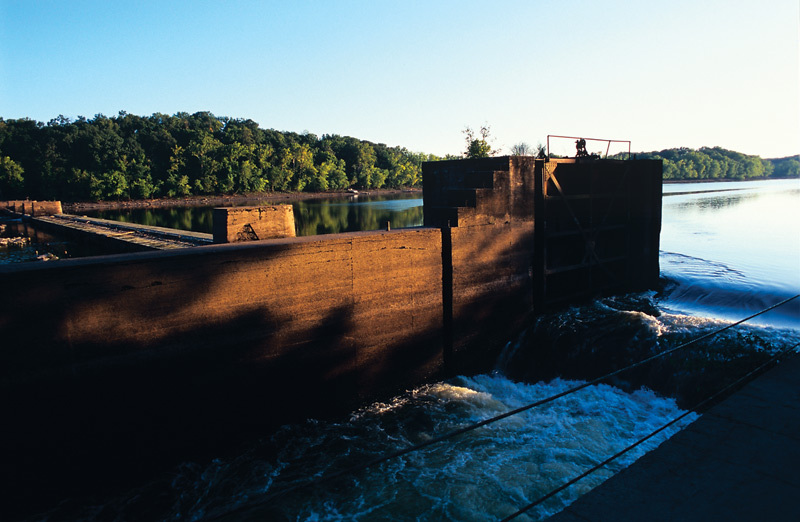 The Osage River is murky, with a more Shakespearian history, a more robust historical aspect. Clear rivers are rightly called scenic. Nature is more dominant there. Nothing like paddlefish or big blue catfish there. More artistic.We started on The Osage River: paddlefish, prairies, farms & villages, dams & reservoirs, imperial Indians, explorers, slickers, sportsmen, tourists & various violent, litigious & noteworthy events in the history of the Osage River Valley and at about the 500th page realized it had gone beyond affordable as we wanted an all color book to sell for less than $100. 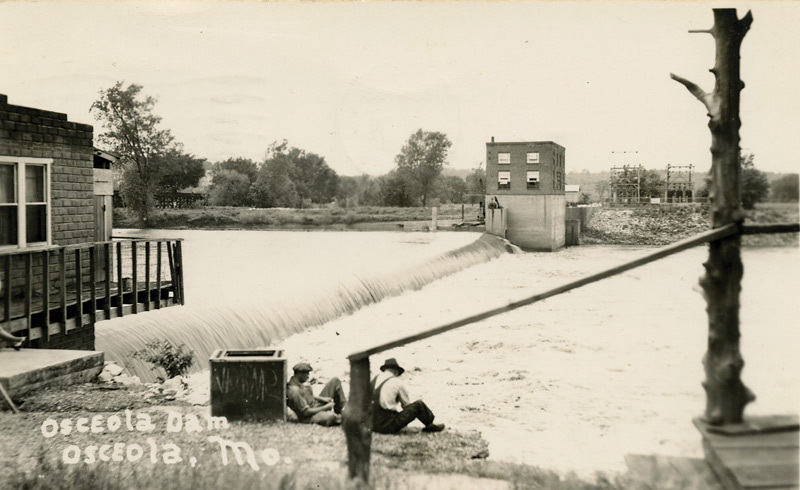 It was our own form of cultural geography, an exploration of life along the river through generations, with a vaguely Carl Sandburg-1920’s-1930’s-Americana feel to it. We knew we didn’t want it to resemble William Least Heat Moon’s mooney stuff.We also realized that the real untold story is the machinations behind the building of Lake of the Ozarks and Bagnell Dam and Truman Dam and Reservoir. These are water resource crimes and misdemeanors on the order of Polanski’s Chinatown. Lots of bitter court battles; two of three of the most important developers of Lake of the Ozarks went to federal prison; Environmental Defense Fund’s 1972 lawsuit against Truman Dam took years, was very contentious and has mysteriously disappeared from public record. Mug shot of Walter Cravens, President of the Land Bank of Kansas City. Cravens was the prime mover behind the development of Bagnell Dam and Lake of the Ozarks in the mid-1920s. He served time in Leavenworth for financial shenanigans that included his efforts to swap Osage Valley farms for bankrupt, dusty Kansas farms (on which his bank held the paper). 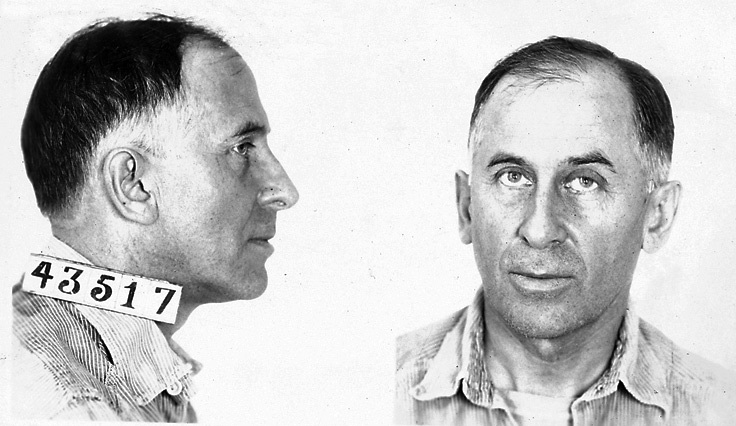 No mug shot available for Louis Egan, high-flying president of Union Electric during the construction of Bagnell Dam, who would up in a federal facility in Florida. We’ve left in a considerable amount on the imperial Osage Indians whose military power, some think, altered the development history of the central United States. And we’ve kept iconic crumbling small towns that pepper the prairie watershed of western Missouri and eastern Kansas.Previous to the dam-building era (the serious, high dams) of the 1920s, numerous efforts were made to improve steamboat travel by planning a series of locks and dams (only one of which was built). More than 150 years of efforts to develop the river industrially that were unrealistic, sometimes criminally motivated, with lots of corruption and sloppy engineering have rarely produced the utopian benefits promised in whatever era. Dammed as it is, resilient American culture on the lakes, tributaries, and watershed of the Osage is still interesting and Twainian in its vigor, variety.We’re ending up with 304 pages, 600 color illustrations (maps, old and new photographs). Hope to send it to the printer in late spring; hope to send it to bookstores in fall, 2012; $35 retail – a huge bargain for such a book.